I will add “eat more fresh berries” to my Summer Manifesto. They are lovely, and not only in taste but in how they look and make me feel inside. It’s easy to forget that it is right now that I need to buy them, bring them home and enjoy them. It’s the same with the beautiful jasmine bush growing on my street (the white flowers smelling divine as I pass it after work), the roses in full bloom, the open windows and the birds singing outside right now. If you don’t enjoy them today they might be gone tomorrow. This entry was posted in Life Stuff and tagged food mood, happiness, summer, thankfulness, zen. Bookmark the permalink. That’s a summer breakfast at its finest! Strawberries are super healthy too. I’m hungry now…and I think I know just what I want for breakfast. Wonderful pictures of berries. Beautiful berries! 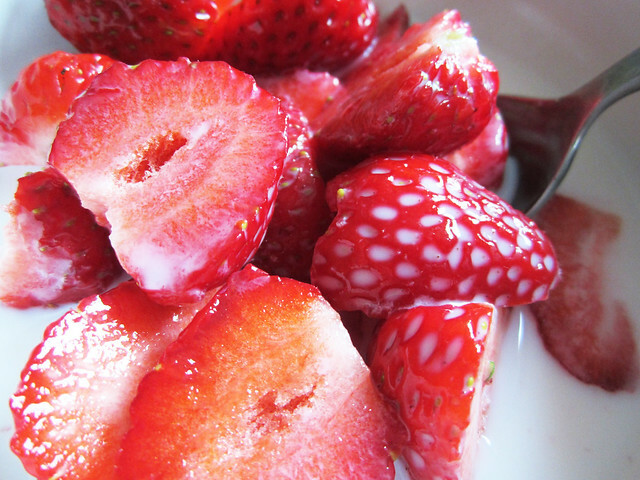 Are strawberries your favorite? I love raspberries and blueberries the most. mmmmmmmmmm and if you eat them with a shortbread cookie it tastes just like…. what else but Strawberry Shortcake!!!!! Thats a treat in America, is it for you too? Sommarblommor efter vägrenen när jag är ute och springer. Det är så vackert och doftar så gott att det känns overkligt ibland. Love strawberries, eat them with “långfil”. July in Italy means… watermelons, melons, peaches and all sorts of tomatoes. And I’m really enjoying these things at the moment! what a fabulous shot of the berries and how the milk is in the little indentations…very nice::)…have a berry nice evening! !